Has your family, friends or community been touched by the opioid epidemic? 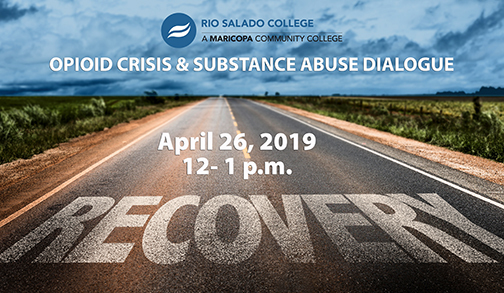 Join Rio Salado College for a discussion about our country’s substance abuse and addiction public health crisis-- and how it’s impacting our communities, Friday, April 26 at the Rio Salado Tempe headquarters. Rio Salado’s Faculty Chair of Addiction and Substance Use Disorders program Kirk Bowden, who is a leading authority on the subject, will be joined by Rio Salado Faculty Chair for Counseling Melanie Abts and Counseling Adjunct Faculty Gary Zarchy to lead the discussion and field questions from guests. Event questions, please contact katherine.ricker@riosalado.edu, 480-517-8575. According to the National Institute on Drug Abuse, more than 130 people die after overdosing on opioids every day in the United States. Learn how we got here and what tools are available to help make recovery possible. Rio Salado is one of Arizona’s top educators of addictions counseling professionals, offering online classes, certificates and an associate degree in Addictions and Substance Use Disorders. Visit www.riosalado.edu/ASD to learn more.